From the various Footy Forums and the AMYA magazine you would think that model yachting is all about the racing (and the rules). 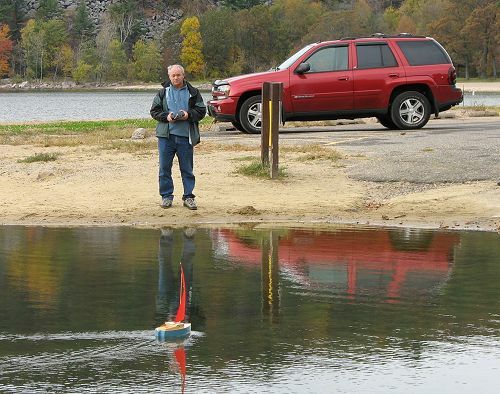 I believe that there is so much more to enjoy in model sailing than that. I do admit that when I race in a regatta I am competitive, I am trying to win without a doubt. 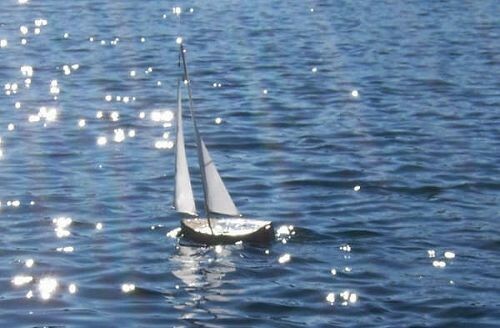 But the vast majority of my time at the pond with a model yacht is spent sailing just for the sheer fun of it. Kittiwake K2 kit number 284 just left the boatyard which proves to me that I am not the only one sailing for fun. Certainly Kittiwakes do turn up in race results and a good number of club footy fleets around the USA are full of Kittiwakes. However that still leaves the vast majority being sailed as simple fun boats, travel boats, kids project boats, family boats, hobby boats, retirement boats, in fact all of the really important kinda boats. Of which I am very pleased! Windling describes this sailing for fun attitude. Formerly the writer of ‘Windling World’, a self produced real paper magazine for many years. Mark now continues his wonderful writing online. Take a while to read his archived pages and I am sure that you will find great enjoyment and inspiration too. So if you have just discovered Footys or model yachts in general please be assured that for the majority of us it is all about the pleasure of building and the fun of sailing quietly on our beautiful lakes. Racing is there if you want it and is enjoyable too, especially with Footys where the people actually running the regattas are intent on keeping it simple and fun. So build a Footy and join us, sailing just for the fun of it. 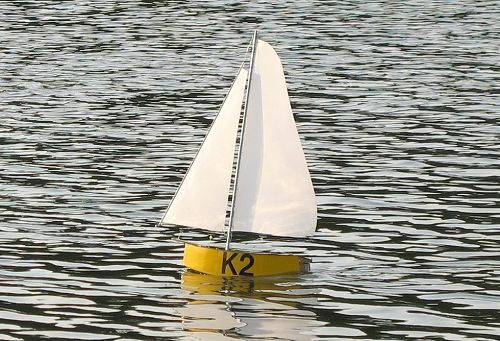 The first batch of Kittiwake K2 kits are now available from ScaleSailing.com please see page http://www.scalesailing.com/product.htm and click on the photo for more details. As you see in the spread below the new kit includes even more laser cut plywood parts and now carbon is used for the booms, low tension forestay and rudder shaft. The photo CD has a complete new photoset for the K2 construction and the paper text has been re-written. 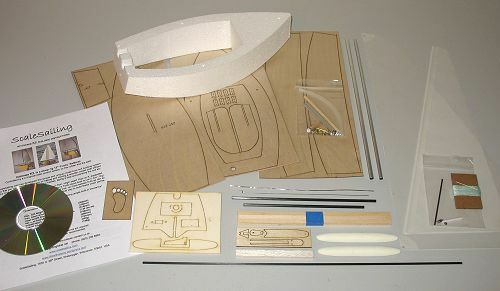 I believe that this kit goes together even easier than the original Kittiwake so I hope that you will enjoy it at least as much. The rigging has been simplified as much as possible without compromising the vital adjustments. There is no need to drill the booms now, all fitments are attached and adjusted with silicone tubing which make everything adjustable. I am loving sailing this boat myself, had another two hours sailing on Sunday morning. She responds well to adjustments as described via the ‘sail tuning’ tab above and should prove to be a good little sailboat on which to learn the art of tuning. I can’t wait until the next raceday! 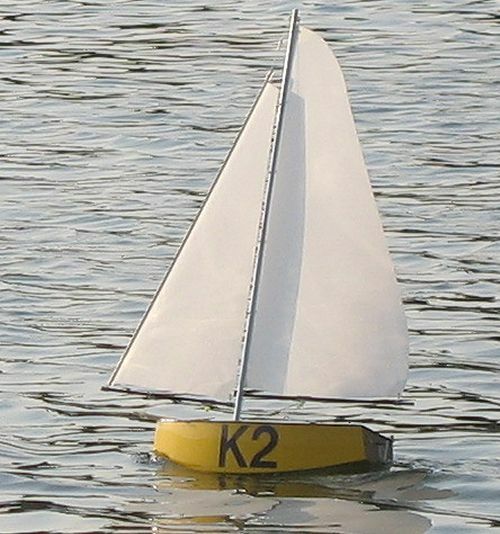 Yesterday evening Kittiwake K2 took to the water to try out the new sail plan. There was a good breeze coming and going which offered most of wind speed range I would expect this rig to be sailed in. I am pleased to report that everything looked good. I particularly like this sail plan which I first used on the Pond Sprite design. The main sail has a fair sized roach area which gives me more area low down (a good thing on a footy) without needing a longer boom. The shape holds nicely without any battens too. The larger area jib than the original Kittiwake helps keep the balance right and in the lighter winds K2 showed the expected (and desirable) gentle weather helm. When the breeze got up K2 would luff up hard into wind, so I brought her in and added some twist to the main sail by loosening the kicking strap. The luffs were back under control then and a couple of clicks of rudder lee helm trim had K2 free sailing a tack very nicely. De-powering the main sail with the kicking strap tension will tame strong luffing in gusts on many boats. When that no longer works it is past time to switch to a smaller set of sails. Give that a try on your boat. The carbon strip forestay did it’s job and will definitely be in the kit now. With just enough forestay tension to hold the jib pivot up, the carbon strip holds the luff edge of the jib straight and true. A straight jib leading edge really improves the jib efficiency which is why bigger boats have a back stay to support the mast against the pull of a normal forestay. Despite the larger sail area I would judge that K2 puts her bow under on the run less than the original Kittiwake. The battery is now located at the rear of the radio bay which clearly helps. Driving hard on a broad reach K2 seems to keep her bow up and transom down better too. Overall K2 looks like a quick boat and I will be keen to race her against the fleet at the first opportunity. 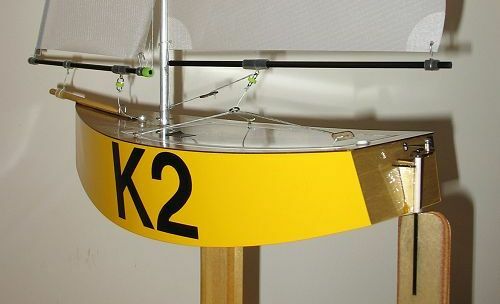 With this new carbon boom rig K2 will be faster ‘out of the box’ for those people who are racing Kittiwakes. For the fun sailor the rig will still work over a good wind speed range with a little lower top limit than the original Kittiwake sail plan. Of course the original sails will still be available for use on K2 as well as drawings for the class legal ‘B-rig’ for home construction. OK it’s back to the workshop and get this kit together for you guys!